DELL to use Turion 64? Excellent find, sharikou! That old article certainly puts the lie to the claim that Intel had worked out a 64-bit extension to x86 a long time ago and just abandonned it in favour of Itanium, and then dusted it off again after AMD made it popular. 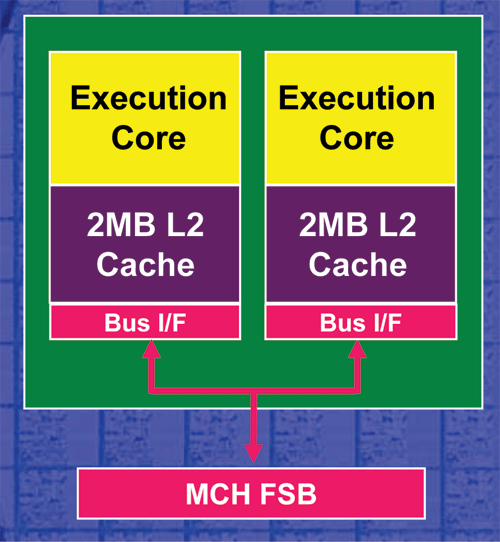 Intel has built-in memory controller four years before AMD. Remember the Timna processor? It even has a built-in graphics engine. Intel also the inventor of the PCI-E which is basically the same point-to-point connection. AMD only uses that in their CPUs and call it hyperTransport. If these so called advantage are really that nice, why IBM, HP and SUN are still using the "OLD" technology on their chips? The reason is easy, these technology pushed the CPU design to a dead end. Heard anything new from AMD in recent two years? No, cause AMD will be the one to pursue giga-hertz game since it cannot improve the architecture any further. It's the same top guys made Alpha made AMD64 and it is foreseeable the family will hit the same wall in the coming years. As to the instruction set, it just a lie. Intel can do a dynamic translation from Itanium to X86 at runtime, you believe they cannot add 64bit to X86? And how many client application are 64bit and do you really think it's necessary? Anyway, this is a nice page and that's it. "And how many client application are 64bit and do you really think it's necessary?" Yep. Just ask your local MS SQL or Terminal Server admin. Great read! This article provides good insight for the technology used, and proves what needs to be proved. if intel can do it, why dont they? It's obvious that AMD can perform better and have proved it, take a A64 3500+ with an intel at 3.6ghz, on both 90nm technology, its obvious who will win because of their architecture, even though they have slower clock speeds, they outperform intel anyday, and no i dont beleive they will run into problems, because they came out with true multicore into one cpu, whereas intel has to put two cpu dies into a chip casing and so they opterate via FSB, =not multicore at all. AMD has successfully made multicore a success and will continue to make it a success with their quad core, and eventually octa-core processors. Are those CLIENT Applications? How many PC users run SQL server at home or even at office? And there are more every week. I agree with the article, Intel hasn't been able to touch AMD since the first Northwood cores. I believe tomshardware.com has a great article on Intel’s "dual core" architecture. I don't think Intel cares much as long as it ships processors. I mean for the last 2 years we haven’t heard anything, except for the baking of our motherboards under a 3.8 GHz P4, now Intel is struggling to keep up using architecture based on its laptop processors. In Intel’s defense their mobile architecture is much better than AMD, the whole Centrino pack is stable and fast; far better than AMD's Turion in my opinion. And if everyone has watched the news, laptops are becoming a dominant market force, so Intel may not be missing out on much as far as the money goes...and that’s what it comes down to anyway. Although, specializing in one market segment could run Intel into the wall...as the American auto industry found out with SUVs. After Intel’s first quarter results, I think it is clear that the processor wars will heat up again after a year of nothing (my FX55 is still top class) and we can all look forward to tons of cores…I can’t wait to get my first processor with as many cores as my new Gillette fusion, or better yet perhaps some future computer specs: 32GB RAM, 32 Cores, 32 TB…sounds like it will run battlefield or SQL server. wow, you must own AMD stock eh ? Nice article. I definatly have to agree. I've always thought AMD had better performance, all the way back to the AMD 486 100Mhz (out performed the Pentium 75Mhz with a 486 core). I see lots of comments here about how we haven't heard much new from AMD. Well, we haven't heard much groundbreaking news from Intel either. Intel is now the one playing catchup, kind of like Microsoft. The let their technology stagnate while competitors have inovated. OEM lock-in was their friend, but the OEM's are getting smarter. Perhaps the notebook is coming into a mature market, but AMD brought it a good portion of the way. They drove prices down with cheaper technology, forcing Intel to compete on price and features. Heh, my AMD Sempron notebook from HP run WoW fairly well. Almost as well as my main system, but that's a memory issue, not CPU. In the long run, the better technology will eventually win the market, that's a given. I'm just enjoying the $750 laptop, down from a few grand just a few years ago. Kinda late to respond to this, but I have to. Intel also the inventor of the PCI-E which is basically the same point-to-point connection. AMD only uses that in their CPUs and call it hyperTransport. No. And absolutely no. PCI-Express and Hypertransport are very different. Essentially, the overall point is that HyperTransport is a true Peer-to-Peer topology connection, while Serielized buses such as PCI-Express are exactly that, serielized. As to the instruction set, it just a lie. Intel can do a dynamic translation from Itanium to X86 at runtime, you believe they cannot add 64bit to X86? Okay, question for you. Exactly HOW slow is X86 code on Itanium in emulation mode? 50%? 40%? 30%? According to Wikipedia's Itanium page, initial performance was about 1/8th the speed clock for clock. Granted, Wikipedia's accuracy is generally somewhere around the same expected from a liberal democrat during voting season. That is very little accuracy for those in MIT. So the answer is yes, Intel could use the emulation. But we already know that this is slow to begin with just using Northwood and Prescott processers as an example. Now that Intel's roadmap is even clearer at this writing, returning to the true-32 bit design of the Pentium Pro, it is going to be even more difficult to try to convert the architecture into 32 bit. So at this point, I think it's more than a belief, but established fact. well since this is outdated i might as well let u know that amd is still in the same place doing nothing to further its proccesors while intel just released the core 2 duo exteme that out performs the best AMD by lightspeeds. Intel also just showcased their quad core proccesors. and where's AMD?